I just had a couple great days in Obongi studying God’s Word with a large crowd, most of whom are new believers. I traveled with brothers Abraham, Asili, Dennis, and Sam on Saturday (29th) for discipleship training in the morning and early afternoon. 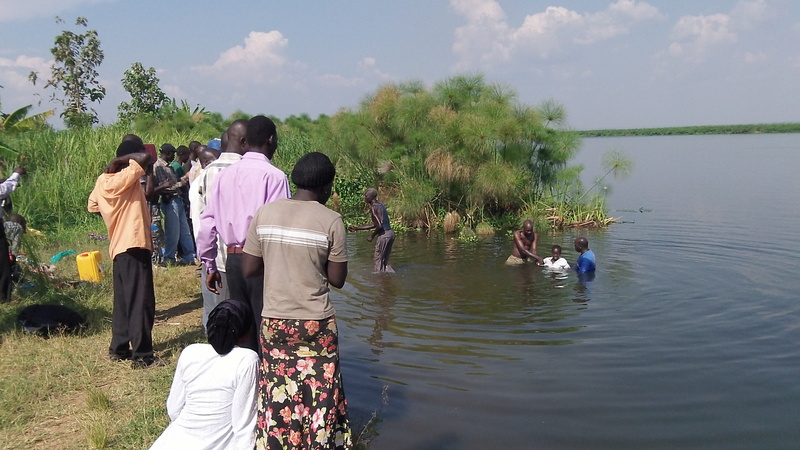 Later in the day, 22 people made an open proclamation of their faith in Christ Jesus through baptism in the nearby Nile River. On Sunday Sam and I returned to bring more teaching and encouragement. While the participants all expressed gratefulness, I have been the one to be frequently encouraged and exhorted, as well as convicted, by the Christians here in the West Nile region of Uganda. Case in point: when Sam and I traveled back to Obongi on Sunday the believers wanted to make sure that we would be there the whole day so that they could receive their fill of teaching. After we left Saturday, they stayed up until 1AM studying God’s Word, praying, and worshiping. They slept at the church and were up at 5AM to pray again. When Sam and I and arrived Sunday morning we found them in the midst of vibrant worship. Most of these believers are very new in their faith and love of Jesus. They want so much to be together to worship, pray, and receive the Word. If we had had our own vehicle (we hired a vehicle on Sunday), no doubt, we would have started teaching in the morning and gone late into the night, soaking in God’s Word together. Each time I would finish a lesson, we’d sing a song and Pastor Godfrey would say,“We are now ready for your next teaching.” These new believers in Christ, in the midst of persecution, are teaching me much about what it really means to love the Lord! My Christian friends, be encouraged by these Obongi believers to spend your Sundays with the same heart and love for Jesus! Pray for Obongi Town Church. Reaching Africa’s Unreached (RAU), together with its partners here and in the USA,helped start this church last November. Pastor Godfrey, who was mentored at RAU, is doing a wonderful job leading and feeding this new flock. We have secured a place of worship which we are renting. Tarps which came from Texas via the container gave us good shade and a nice covering for the ground for people to sit on…thank you Danny Hoffman. We are continuing to look for a plot within the town to build a simple structure along with a Hall of Tyrannus Obongi Branch. 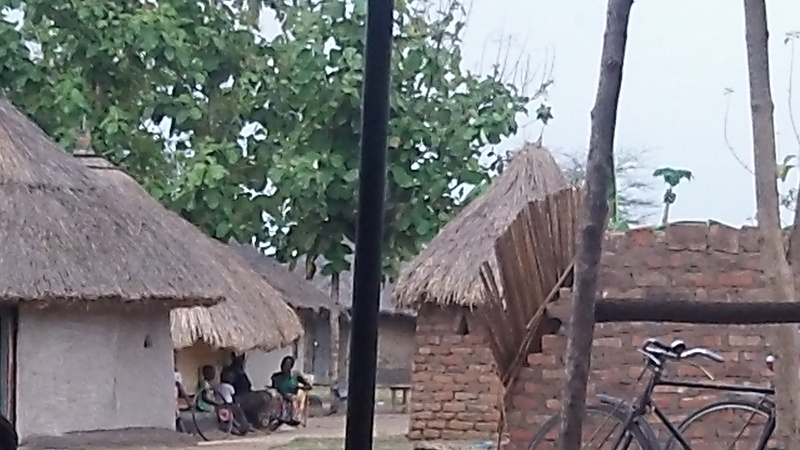 The Obongi Town Church is the only evangelical church within this town of 20,000+. There was big crowd for the 22 baptisms on the 29th and I am told that there is a “stir” in this Muslim dominated town about this “new” thing that is happening there. 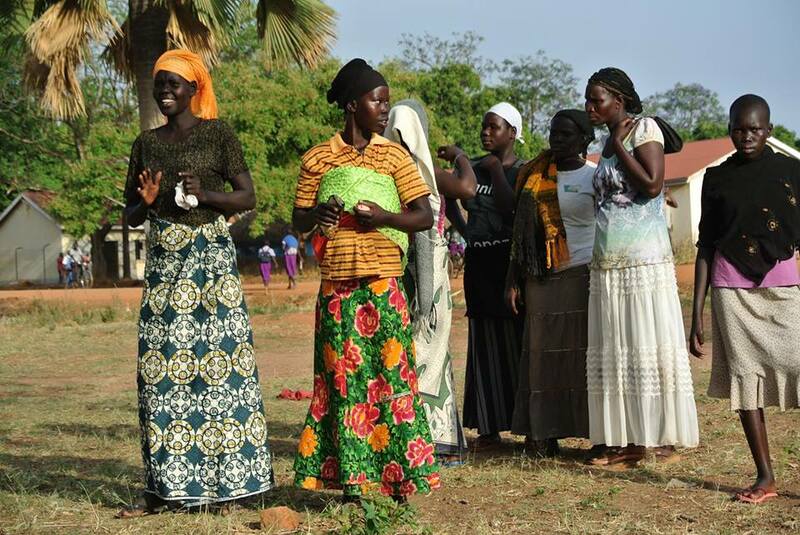 During the the baptism, several women came to a co-worker and told him they want to follow Christ but are afraid of what their husbands (Muslims) will do to them. 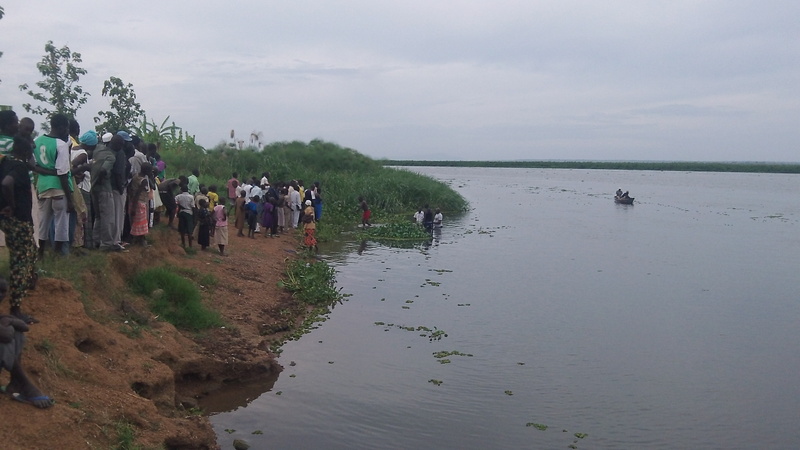 Standing in the Nile waist-deep in water, co-worker Abraham preached a powerful gospel message right before the first baptism. After one of my teachings on Saturday, a Muslim man came to one of the brethren and said he wanted to follow Jesus too and was added to the family of faith! This converted Muslim man then brought a friend on Sunday who, in turn, also believed upon the Lord. In total 7 people people trusted in Christ in the two days of teaching while listening in on or attending the discipleship times. PTL! I never would have imagined that teaching from the parables would be used of the Lord to bring people to Christ. My messages were directed to the believers for their encouragement. It was through teaching on the Parable of the Mustard Seed and Leaven that the Muslim man was saved and then on Sunday, after the message on the 10 Talents another trusted in Christ. Even another, after the message on the Parable of the Two Foundations, trusted in the Lord. It is not known exactly when the other four put their faith in Christ, but each of these seven who trusted in Christ confided in one of the church members who then in turn pointed them to Christ Jesus. What joy it is to be in the middle of what the Lord is doing! Godfrey is on the far left, the man in the white is the the converted Muslim and one next to him is the friend he brought Sunday. A brother is sharing God’s Word. He trusted in Christ alone for his salvation and joined us for the rest of the day for the teaching. God is adding people to His church in Obongi and there is much rejoicing, not only in heaven, (Luke 15) but also in Obongi. This new church along with Pastor Godfrey have received continual opposition since it’s start. The persecution will no doubt continue but the Lord will sustain His people and cause them to “GROW IN GRACE“. Pray for this church in Obongi and all the believers in the nearby regions. Pray also for RAU as we seek to strengthen Christ’s bride in the West Nile Uganda, especially in the unreached areas of Obongi and Yumbe. Please pray for the upcoming pastors’ discipleship retreats here at RAU. They are scheduled for April 8-11, April 29-May1, May 20-23, June 10-13, and June 26-28. These times are expressly meant for teaching and strengthening pastors/church leaders in the faith. Lessons begin in the morning and go until bedtime. The pastors are provided for while here. Because most of them have no means of transport, we also arrange for bringing them here and transporting them back to their homes. RAU’s first and primary calling is summed up in 2 Timothy 2:2, “and what you have heard from me in the presence of many witnesses entrust to faithful men who will be able to teach others also.” I do covet your prayers for these retreat times that the Lord would give refreshing to the church leaders so that they may go back to their congregations empowered to feed their sheep and help their churches become multiplying churches! *Prayer for the pastoral retreats and funds needed for them. It costs about $1500 to host each pastors’ retreat. We are limiting the number to 18 for these retreats as we want the the teaching to be more intimate and the dialog to be easier. The world will be reached through multiplication not addition! A little over $80 per person allows pastors to stay with us for these times of encouragement and teaching. Investing in these men will reap untold eternal dividends. * Pray for the Obongi Town Church. Please also pray for us to find a suitable plot of land where this church could be located along with a Obongi Branch of the Hall of Tyrannus. We currently have $3,000 that has already been given. May more come in! I would like to go there each Monday for discipling the church leaders. *In my last newsletter I told you about a plot in Yumbe for a Hall of Tyrannus branch office there . At this point, no funds have been given for this purchase. The plot costs $6000 and it will take at least another $6000 to renovate the the structures on the plot and build a protecting perimeter wall. With the $12,000 we could have an operational Yumbe Branch of the Hall of Tyrannus for weekly discipling of pastors and leaders in Yumbe. 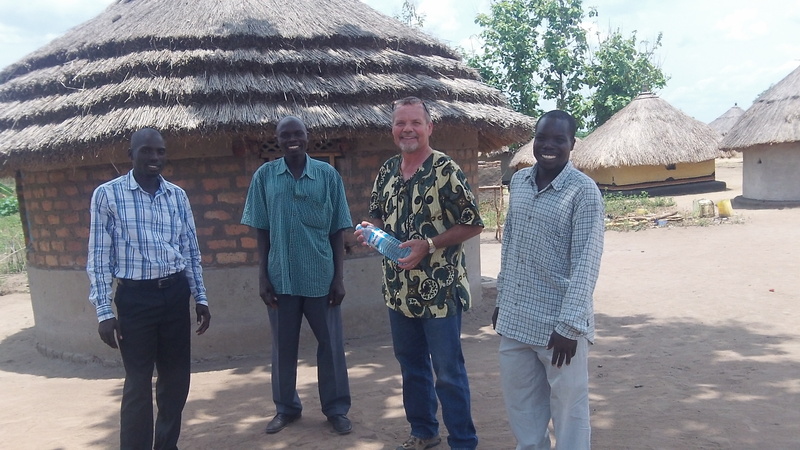 Please consider helping us proclaim the gospel in Yumbe which has very few believers. We believe that we can best do our part in this by targeting leaders with teaching and encouragement on a weekly basis. This is the plot with buildings which are for sale in Yumbe town. This would make a beautiful place to establish a branch of the Hall of Tyrannus in Yumbe. Please consider giving so that we can began discipling pastors and church leaders here on a weekly basis. *We are needing to get a disk for the tractor which came in the container. This would greatly aid us in raising crops on RAU’s land. The crops could be sold to help fund the ministry. We are also looking at planting another 100 mango trees for the same purpose. Our perimeter fence was in bad shape. 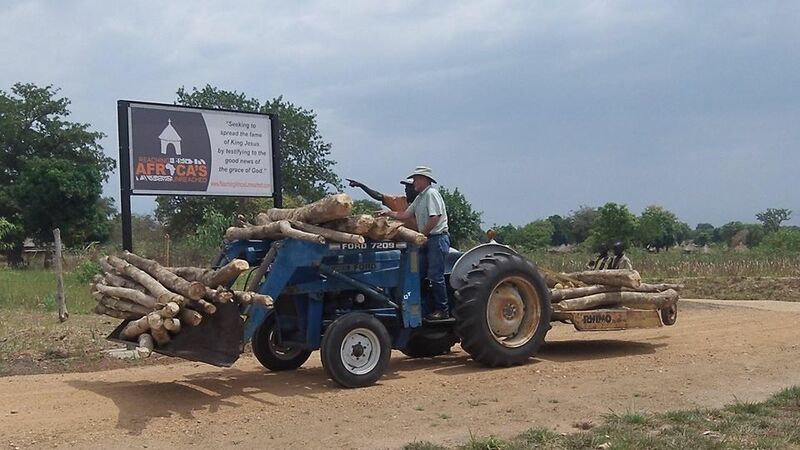 First we had to harvest teak logs for posts and then bring them to the fence line. The tractor has been a real blessing to the work. With a disk it would be even a greater blessing! *The first ever Aringa New Testament is coming out in June. Three dollars will purchase one. We would like to purchase many of these New Testaments for our work in Yumbe District. Also for around $1,500 we can have 20,000 Quest For Joy tracts published in Aringa for distribution in Yumbe. * Please continue praying that at some point soon we can get the Medical Clinic and Christian School operating. With 17 acres we have the room and there are Ugandan brethren who could help facilitate the Clinic and School’s operation. I have written in the past about these great needs in this area of Africa. The Lord continues to bless and open doors for us and enabling us in our pursuit to spread the fame of King Jesus where He is least known. Thank you for your prayers and support. I often think about the truth of 17th Century missionary William Carey’s “rope holder ” example, “Saving souls can be likened to a man drowning in a deep well and a volunteer can do nothing unless there are people who will hold the rope for him to be lowered till he reaches the drowning man, and then pull them up to safety… I will go to India as a volunteer to seek sinners drowning in the well of Sin. But I can’t do it alone. I need rope holders.” We, like Carey, will not nor can we be effective witnesses for Christ here in Northwestern Uganda and the nearby regions without your loving and sacrificial support. I thank you with all my heart! We have an active, upcoming schedule in which we need your prayers for blessing,wisdom, and support. There are four pastors’ retreats at RAU on the docket and more to be planned. At these retreats we transport 17-20 pastors/church leaders to RAU and provide for them while they are here from a Tuesday to a Friday. We seek to provide an environment which is conducive to teaching, learning, and study of God’s Word. Because of the generosity of God’s people back in America we are able to provide each man with a Global Study Bible and numerous books which came through the Gospel Coalition International Outreach. Each retreat costs RAU around $1,500 making it a very inexpensive way to walk out 2 Timothy 2:2. If the the world is going to be reached it must be through multiplication not addition! I am also working with local pastors to mentor young men in their congregations for leadership in their churches and for new church plants. This is perhaps the most exciting task I have as a missionary. To work one on one with men who are passionate about our Savior is a grand privileged! These men are not satisfied with just coasting through life. They want to see the church grow and become strong in the Lord and to see churches planted where there are none. Sam and I with Godfrey before we send him off to RAU’s first church plant in Obongi. As I have written in the past, the two most unreached areas near us are Obongi and Yumbe. The Lord is blessing the work there. 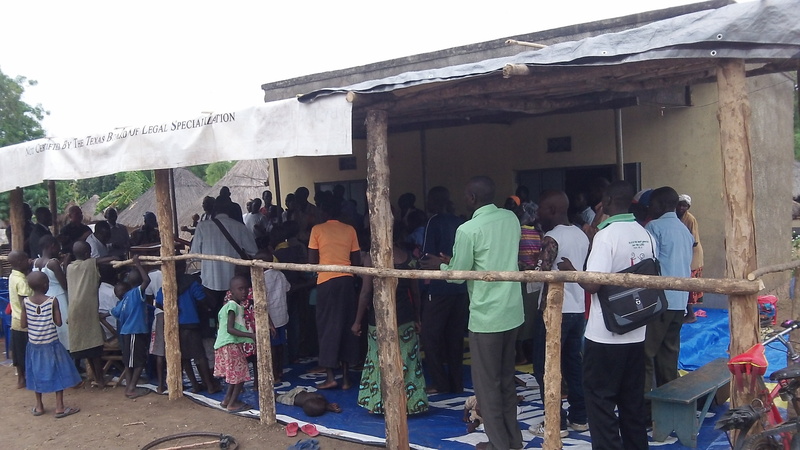 The new church in Obongi and its pastor, Godfrey, who was mentored here, are receiving much persecution in the midst of many coming to faith in Christ Jesus. I told the congregation recently that persecution is not necessarily a bad thing (Philippians 1:29 & 2 Timothy 3:12). They are pressing into a region where the prince of darkness has had his way for a long time. March 29th and 30th I will be in there with Sam and Abraham for teaching throughout the days and baptisms on the 29th. 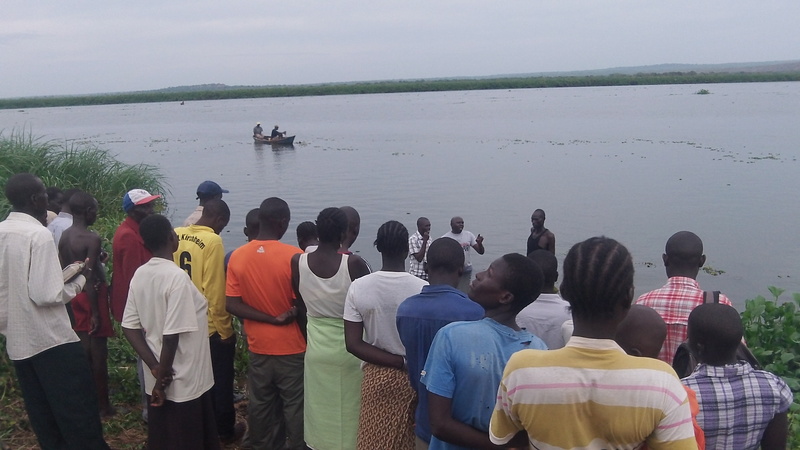 Godfrey reports there are up to 40 new believers ready for baptism from the Obongi Town Church and several surrounding village churches! The church is growing and the need for ongoing discipleship is very great. We have pastors/leaders from that region coming here to RAU periodically, but it is too far for them to come often. I feel the increasing need to go there to them as well, and more so when we have a vehicle. Three thousand dollars has already specifically been given to purchase land for a Hall of Tyrannus Obongi Branch. This is a wonderful start! After the Obongi Hall of Tyrannus Branch is built the Obongi Town Church could also meet there until the funds are raised to build a structure of their own. Currently, the new believers there have been meeting under a trees….it has been even hard to find a tree, at times, under which to worship and have teaching because of the opposition. The rains are about to begin which makes a tree a less desirable place for teaching and worship. Nevertheless, the teaching and worship will not stop… no matter what! Please pray with us for Obongi and the growing number of believers there. In this town of 20,000+, besides the church which Godfrey pastors, there is only one Anglican church with a small group of believers. A piece of property in the town for a Hall of Tyrannus branch and church structure would help in discipleship and lessen the pressure from the unbelievers in the community who are opposing the work. Please lift up Obongi daily in your prayers and especially Godfrey as he faces almost daily, public ridicule and yet without growing bitter, but rather being patient and prayerful. He recently spent a few days with us here to talk over the issues and to have some time to be apart for reading and prayer and loving care. 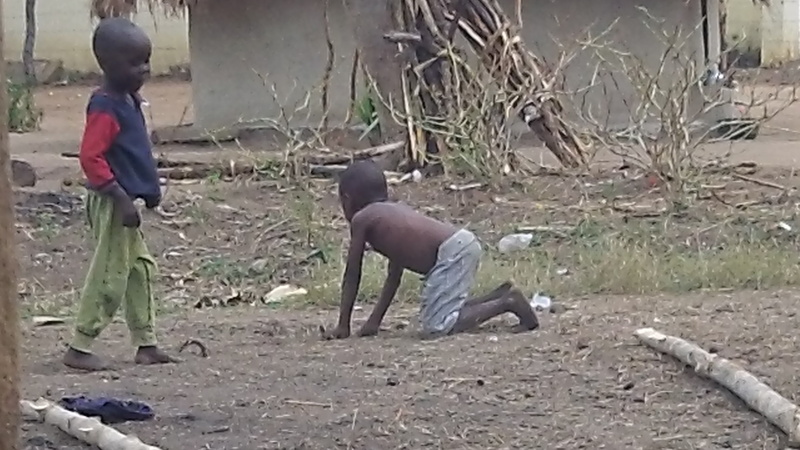 He also frequently suffers from physical ailments, including Malaria and GI troubles. The Lord has opened doors in Yumbe as well. I have written in the past about Yumbe so I will not repeat myself. Something new in the works is the first ever New Testament in the Aringa language being published. It is being dedicated in June and I have been invited to be an official part of its dedication. Also, pastor Charles from Yumbe has translated John Piper’s tract, Quest for Joy, into Aringa and I just received permission from Desiring God to put it on the web page and publish it for distribution in Yumbe. An Aringa NT costs around $3 to publish. Here is an opportunity for you to help put a first edition Aringa New Testament into the hands of believers in Yumbe. RAU would like to get a good number of Testaments to use in our discipleship. 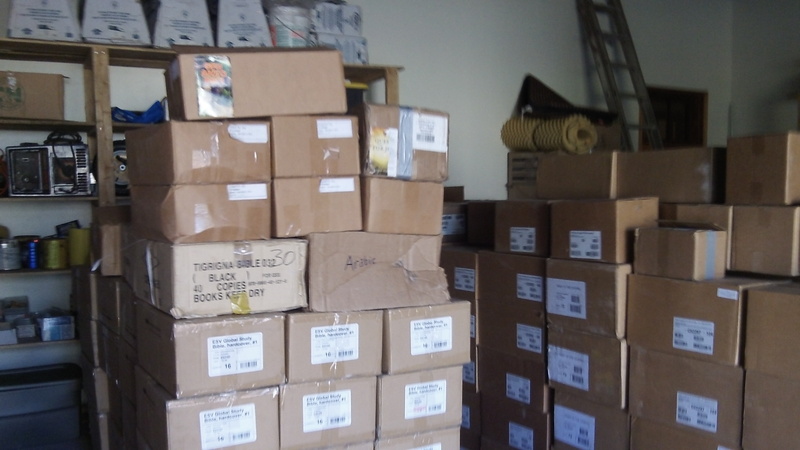 20,000 Aringa Quest For Joy tracts will cost around $1500+-. Doug Salser with Literature Ministries International has agreed to help us with this like he did with the Ma’di version of Quest For Joy. 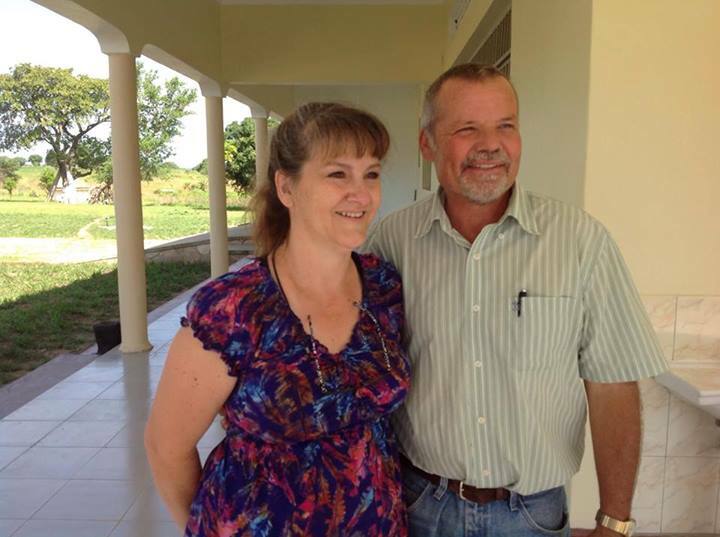 Lord willing, a short term ministry team will be able to bring them to us from the USA. 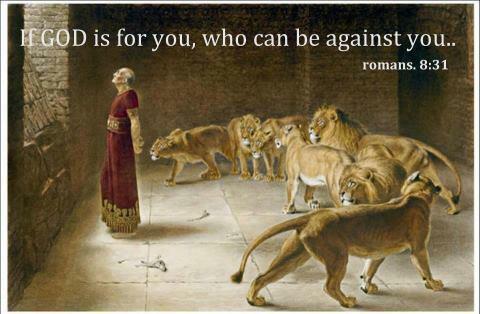 The gates of hell cannot hold back the advancement of God’s Word! There is only an Anglican and Roman Catholic church structure in Yumbe town which has some where around 35,000 people. The Muslims are upset that these churches are even there and it has only been by God’s grace these churches have kept their doors open. 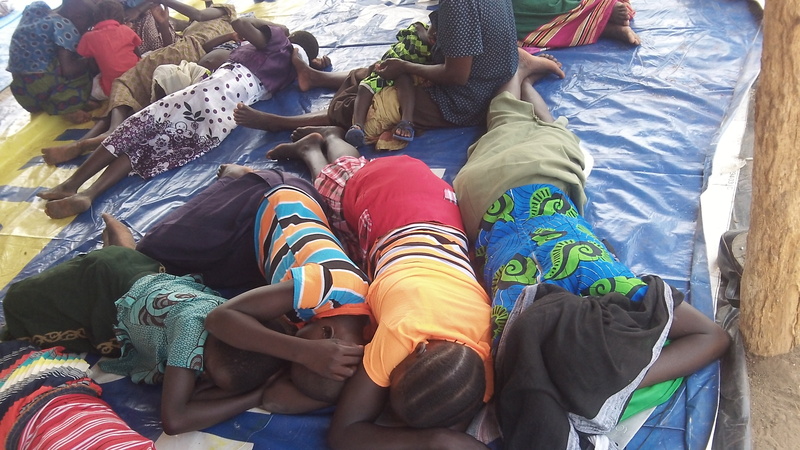 The Muslims are now even more militant in their position that no other churches or a Christian Organization be established in Yumbe town and will “severely” punish any fellow Muslim who rents or sells anything to a Christian. I have also been told that well over 90% of those who meet in these two churches are not even from Yumbe but are people working in the town from the outside…mostly government jobs. The Ugandan constitution allows the freedom of all religion in the country and the Lord using this to help us and others do Christian work in Yumbe. 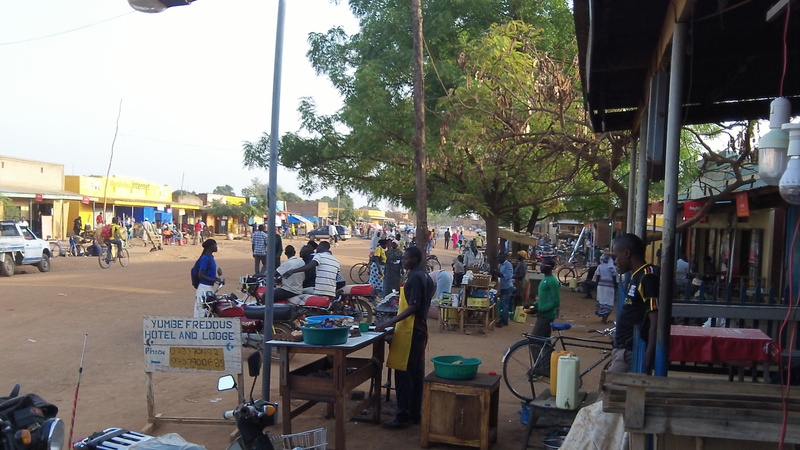 This is main street Yumbe. It has a population of 35,000+- with evangelicals numbering less than 1%! In the the midst of this I received information that a Christian brother was willing to sell his plot in Yumbe town which already has two structures on it. There is also room for growth on the plot. 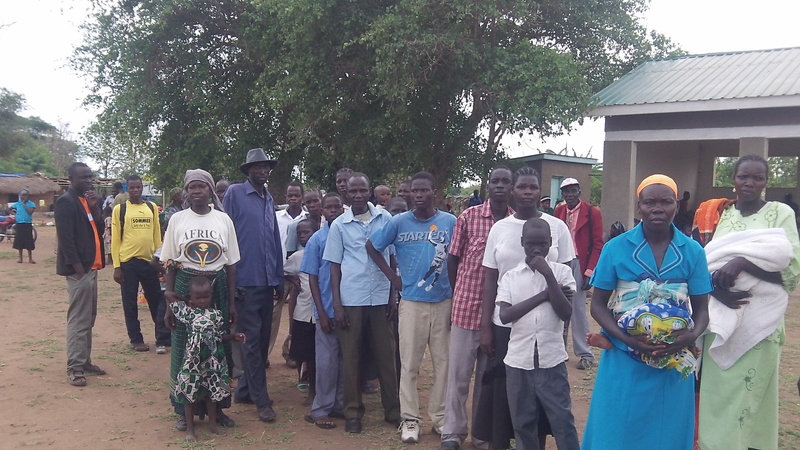 There are very,very few Christian brothers who have any land in Yumbe town. He is willing to sell it for $6000 and it would take approximately another $6000 to refurbish the buildings and build a perimeter wall for protection. There are two nearby Mosques. Pastor Charles already rents and lives in one of the building and is watching over the property. He could do the same for us if we can get the property. Sam and I, along with pastors Ben and Charles, looked at it on the 19th and we liked it! 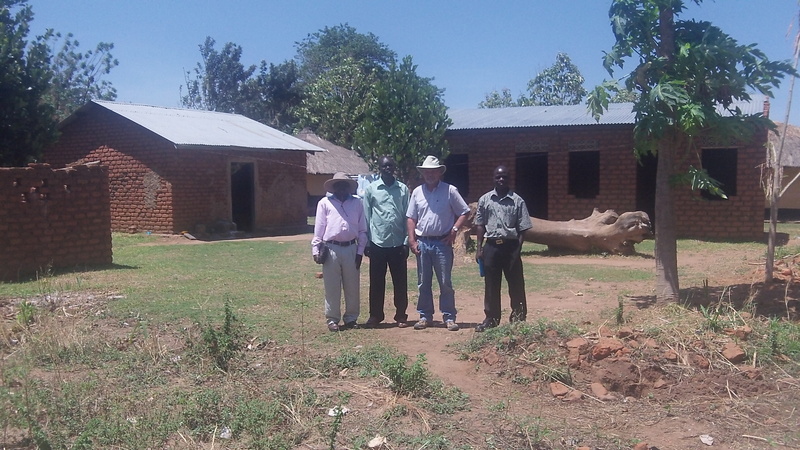 RAU Africa board members Patrick and Abraham also think the property is an open door for RAU. We are actively bringing pastors here from Yumbe and also young men for discipleship. For the work of God to grow in Yumbe there also needs to be active,regular, and ongoing discipleship there in Yumbe itself…training others who teach others is RAU’s main purpose . 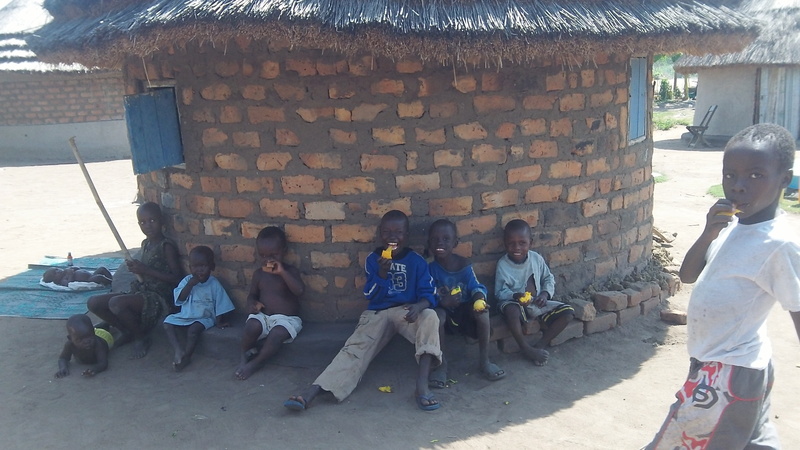 Pray with us and consider helping us spearhead this gospel work in Yumbe. With these branch Halls of Tyrannuses in place we can go weekly or biweekly to train pastors and leaders along with also bring them to RAU for retreats. It seems the Lord has opened this door for us in Yumbe. 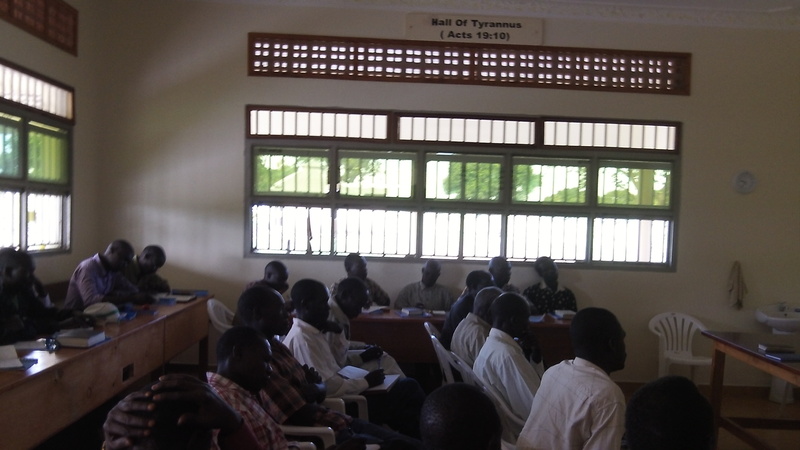 Please pray with us and believe God with us for a Hall of Tyrannus Yumbe Branch where pastors,evangelists, and church planters can receive ongoing teaching in the Faith. Last week I was in Kampala and personally, along with Patrick and Sam, met with the Ugandan broker who ordered the ’99 Land Cruiser for RAU from Japan last Fall. I urged the broker strongly that we are going to get a lawyer to enforce a refund if he did not repay RAU its money. The Ugandan broker is also a medical doctor and does this on the side. In the past, he has successfully handled over a dozen vehicle transactions with the same Japanese broker/company. I came to the meeting “loaded” and with simmering anger but, after meeting the broker and talking with him, I ended up rather liking him and having to repent of a bad attitude. The Ugandan broker has been working with Interpol and begged we give him one month more and so we agreed in writing that at the end of a month’s time if he has not received the money back from Japan he would have to pay RAUback personally the $15,000 we gave him for the Land Cruiser. We really need a vehicle, especially with our frequent travels to Yumbe and Obongi. Once we have the money back we will try to find a strong vehicle in Kampala this time fit for the rugged travel here. Please be in continue prayer in this matter….thank you! May the Lord richly bless you, keep you, be gracious to you, and make His face shine upon you! 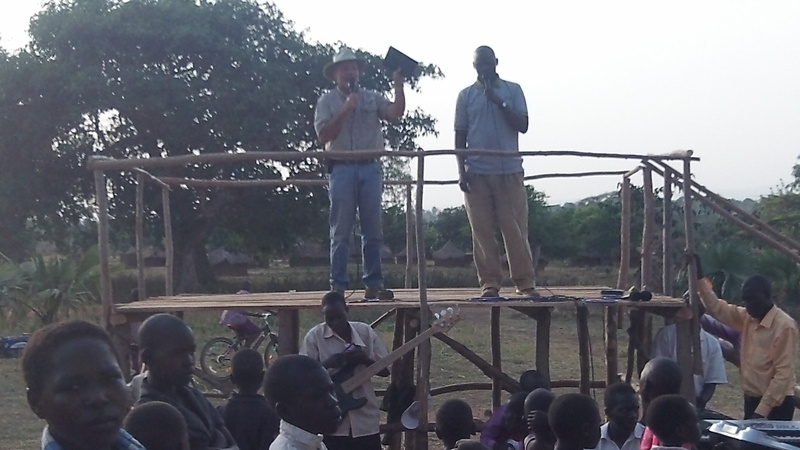 It is a privilege to be able to preach this very same glorious gospel here in the West Nile region of Uganda! 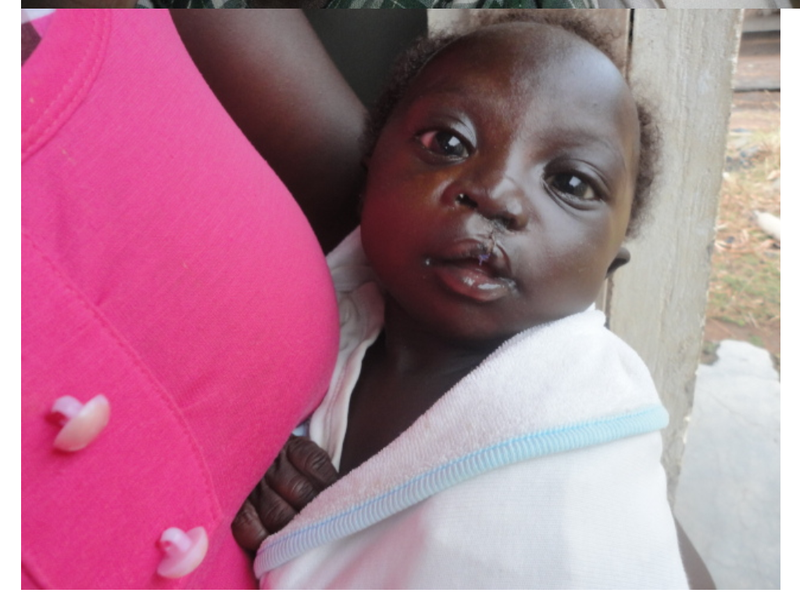 Reaching Africa’s Unreached has had the privilege of helping this child with corrective surgery. The child was discovered while we were having a medical and evangelistic outreach in Yumbe District which is located in northwestern Ugandan. The child needs one more followup surgery in one month. We also have the opportunity to help distribute the first ever translation of the New Testament in Aringa. Each New Testament cost 7,500 Ugandan Shillings (which is around $3 depending on the exchange rate). 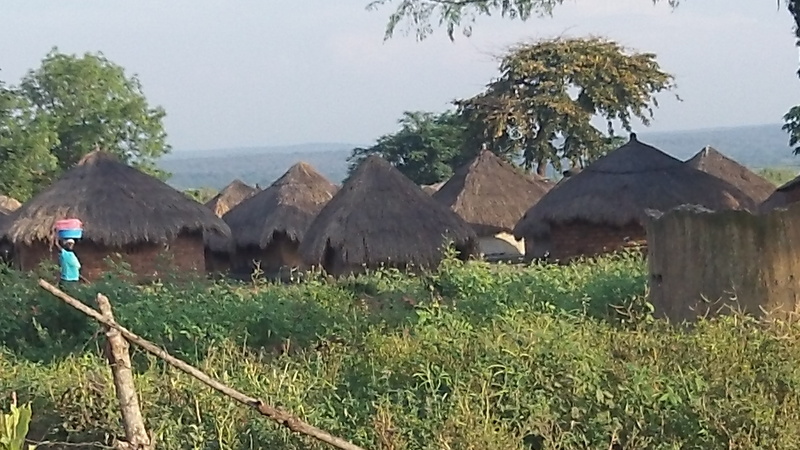 Aringa in the main language in Yumbe District which is predominantly Muslim. Please pray for us and support us in these efforts if you are willing and able. There are a few things I appreciate about writing a newsletter. Notice, I didn’t say “love.” When Jacob reminds me that it is my turn to write there is usually a twinge of resistance. Writing well is hard work! And I am usually in the middle of something I don’t want to stop at the moment. However, writing does some important things for me: it makes me stop and think, look back with thankfulness and remember. In looking back and in looking forward writing helps me gain perspective. It gives me an avenue for creativity. Most of all, it allows me an opportunity to focus on YOU and think about what might be important and helpful to you as you remember us in love and prayer and support. That is, after all, the primary reason newsletters are written. CAVEAT: This newsletter is more letter than “news.” If you are a “just-the-facts-ma’am” kind of reader, you might want to scroll down to the last two pages where you will be directed to the needs of the ministry! Don’t worry! I don’t think I’ll be able to find out who you are! Jacob has done a wonderful job of keeping you all in the loop with pictures, videos and short updates. Those are evidences that the seed of passion and vision that was implanted in his heart many years ago is continuing to grow and bear fruit. The opportunities for interaction with and feedback from pastors only fertilize that passion and vision even more! I am sure that his efforts in communicating have helped you all to visualize more clearly what we are doing and why it is vital. Thank you, Jacob, for your “stubbornness” in taking what could have been an ivory tower pipe dream and making it an in-the-trenches reality. Thank you, Pastor Abraham, for sharing the vision and stirring it and putting “feet” to it so that ministry happens. You and Maggie were so warmly hospitable to Jacob on his many trips to Moyo. You have been an example of one who never grows weary in well doing and who is tireless in making the Gospel message available to so many. You are ever looking for new ways to embody Christ to the people around you. And, another thing, as a result of your efforts, we simply have the best cook around—Lucy!—and a perfect fit for RAU. Thank you, Pastor Patrick, for being a faithful co-worker in the Gospel and a dear friend. You and Vickie have also been a family to Jacob and to me; we have enjoyed your hospitality, your home and family. You have been key in making things happen in establishing RAU: processing documents, researching, communicating, sending supplies, and much more. We and many others have benefited from your teaching ministry. Most importantly (for me anyway!) you have kept me connected to the world with SIM cards! 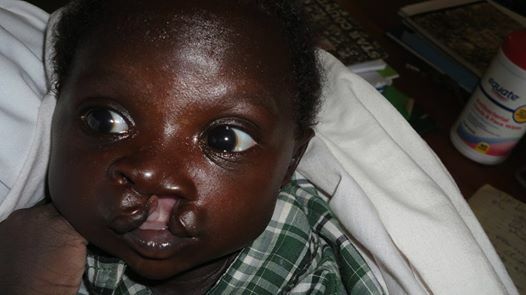 Nurse Sam, thank you for making a conscious, God-inspired decision to partner with us at RAU. You were in great demand by other medical personnel. You could have made more lucrative career advancements, but you chose to heed a calling from the Lord to join with us. You have been invaluable to Jacob as a friend, a great help to him in the day to day operations of RAU, and a member of the family for us. Your joyful faith and integrity strengthen and inspire us. It gives us a great deal of joy to tease you and induce that wonderful laugh. In the very near future, we want people to benefit from your compassionate nursing expertise. 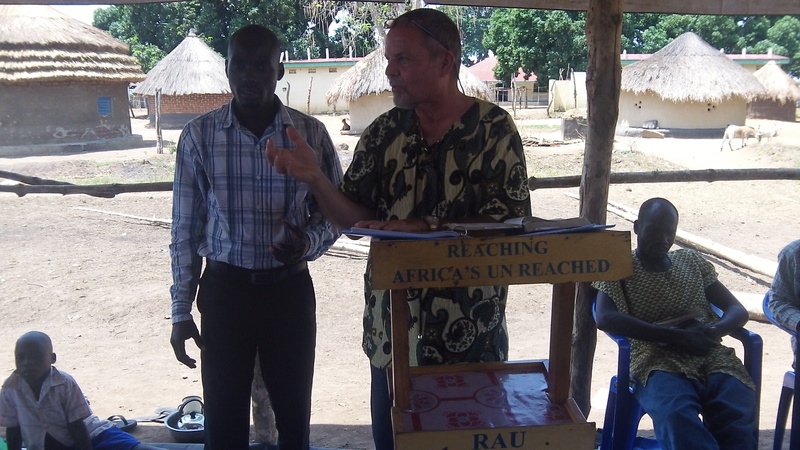 Lucy, Stephen, Aldo and all the day workers here at RAU, though you will probably never get to read this, we thank you, too, because what we are doing for pastors we could not do without you and the benefits of your hard work! Thank you, Rope Holders, for the constancy of your prayers and giving. We have other folks stop in for a visit occasionally and they have commented on the generosity of your support, from money for building and other resources to abundant coffee bean supplies! We are blessed! Jacob and I continue to be amazed that the flow of support never wanes! One might think that you all had a Father who owned the cattle on a thousand hills…or something! This physical support would not happen if you did not first identify strongly with the spiritual vision and mission of RAU. It has been eight months since we arrived. Wow! It seems like we have been here much longer—almost like we have always been here. Time passes quickly when we have been fruitfully occupied. When we first moved to RAU in July of 2013 and up to December there was a LOT of physical labor: building and fixing and furnishing. Thankfully, it did not keep ministry from happening. Kindles from our friend, Delmar Hager, and other resources were being made available. Jacob made the circuit of the local churches to preach and also to make it known that we were here to come alongside the pastors. We had our first Pastors’ Retreat with Ron Zeiner doing a superb job of teaching on Leadership as he worked through Ezra and Nehemiah. Our family grew as we welcomed two American teams here for ministry: the Tennessee Trio—David Jones, Michael Lambert and Eric Williams—and Kevin Turner (Strategic World Impact) and Ron Day. It was an encouraging, learn-as-you-grow season which left us looking ahead to a time of refreshing. Sandwiched in between 2013 and 2014 was a much anticipated return to our hometown, Seguin. We arrived there mid December and left mid January. What a joy to be reunited with all of our children, Josh and Becca, Josiah, Anna and Kenny, and to hug, sing to, play with and rock our grandchildren! Reconnecting with family and our friends from Lifegate and the Seguin area was a great source of joy and encouragement. At the end of our stay trouble was brewing in South Sudan and, for a moment, it looked as if we might head back early. Changing our flight to an earlier date proved impossible and unnecessary—all the better to enjoy more time with family—but it helped us to transition our focus back to the place of our calling. And suddenly…it is March 2014. Oh my goodness! We already have another Pastors’ Retreat and the Yumbe outreach under our belt. 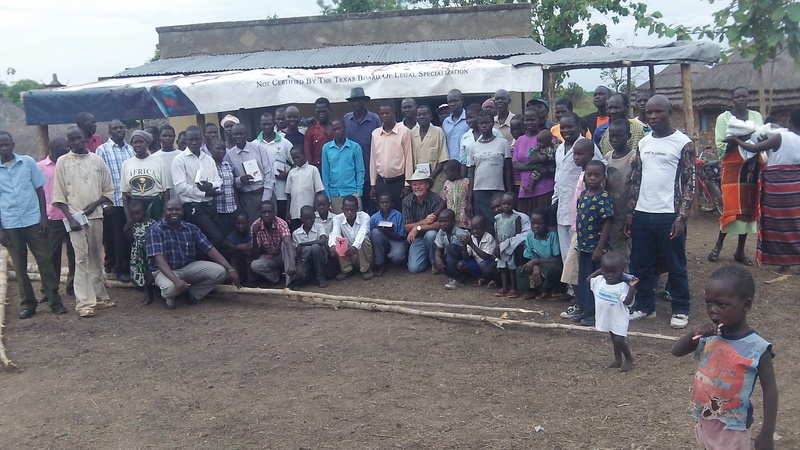 Jacob, Patrick and Elder David from First Presbyterian Uganda had opportunities to strengthen the churches from Yumbe and Obongi. Sam’s, Jacob and my time in Yumbe itself was very fruitful. As Jacob has been so good about explaining, church ministry in these areas can be stressful and lonely; it does the pastors of these areas so much good to know that others are coming alongside to strengthen, encourage and stand with them. Standing on the precipice of future ministry is thrilling and scary! The calendar is filling up fast and these coming events are the ones we know about at this point! March: we are continuing to work on the physical/structural projects of RAU. Now that the container has arrived, all of the contents need organizing and putting into place or good use. Jacob’s favorite project is getting his massive library in ready condition for pastor’s to come and prep for sermons and teachings. 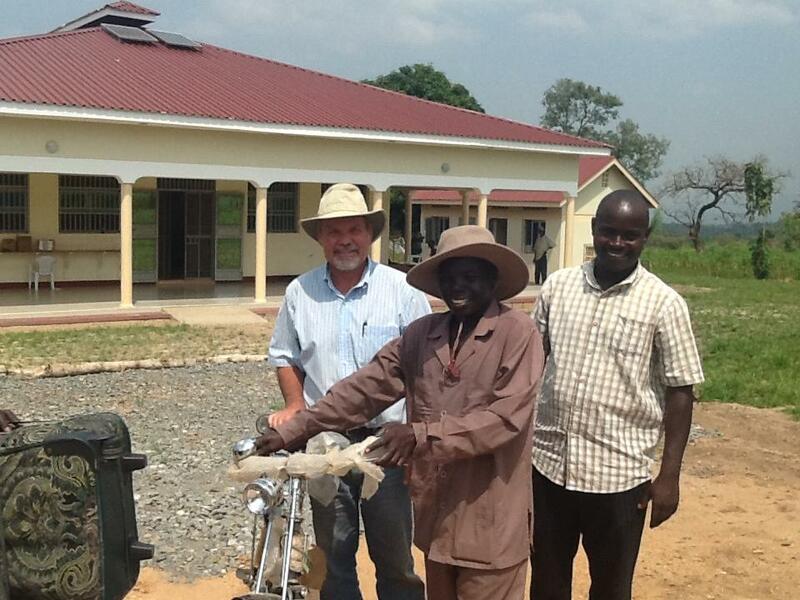 He is excited that they will have the best pastoral study library in the area—maybe even in Uganda! Pastor Abraham said today, “If you build it, they will come!” (Well, he did say, “they will come!) Starting March 17th, Jacob will be going every Monday to Obongi for discipleship and market day preaching. There is a possibility that a dear friend may make a visit towards the middle of March. We will be heading to Kampala with Lucy later this week to meet up with Sam who has already gone for much needed dental work. Everyone (except me) has an appointment. YES! 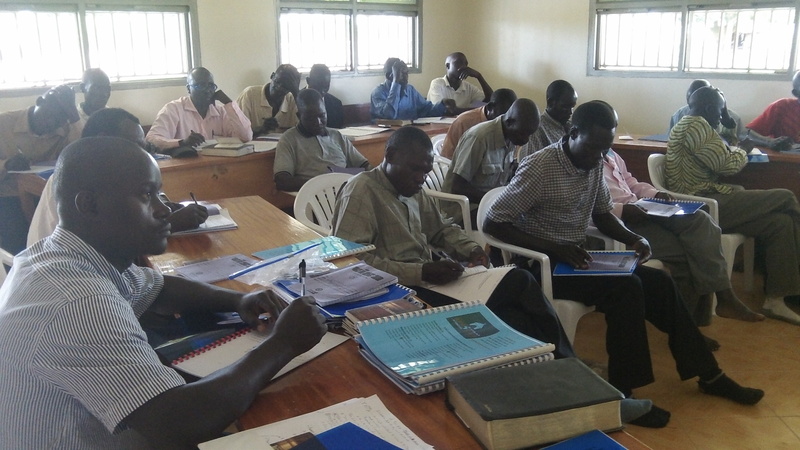 April: We have scheduled two Pastors’ Retreats: April 8th – 11th for 18 Pastors from Adjumani, and April 29th– May 2nd for 17 pastors from the Moyo Baptist Association. April 19th and 20th we will travel to Yumbe where Jacob will preach at Pilgrim’s Anglican Church. May: 18 Pastors and leaders from Obongi will come for a Pastors’ Retreat from the 6th through the 9th and the Yumbe Pastors will return on May 20th and stay until the 23rd. June, July and August: have yet to be filled and most likely they will be! As we have always said, the pastors here are thirsty for teaching and resources. There is the grand possibility of some friends coming for a visit in August. 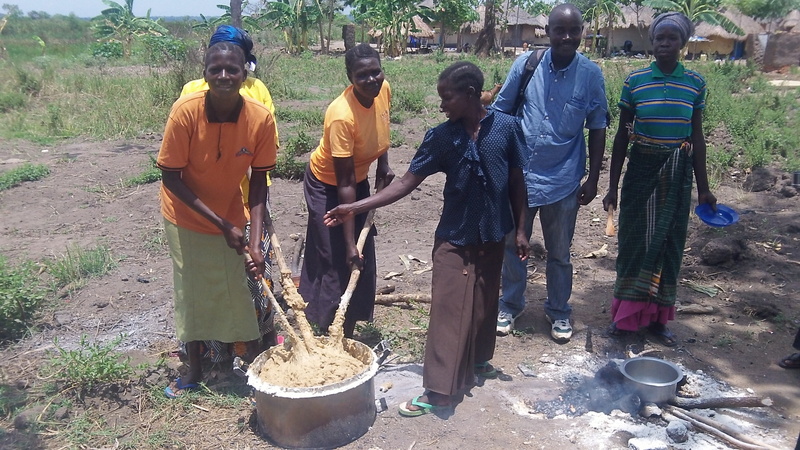 September: the youth group from First Presbyterian Uganda will be coming for the 2nd week in September for ministry. October: Hooray! We will head back to the States for itinerating and reuniting with family and friends. November: We have the possibility of a team from America visiting. 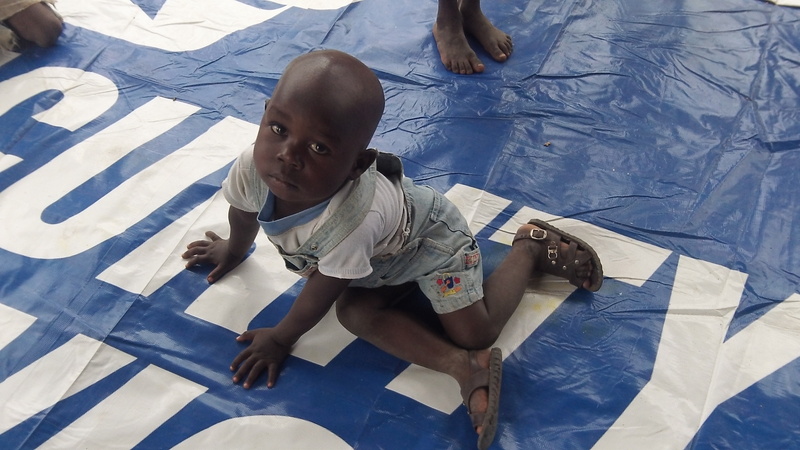 Abraham and Jacob were discussing today the value of starting up a level I health clinic, even if it’s operating from a tent (which came in the container) or small structure. Abraham felt it was important to step out in faith and begin such a ministry even if we don’t have a clinic built and operating. The medical needs here are so great. Even providing screenings, assessments, referrals and simple meds can be a means of displaying that Jesus is still here in flesh and blood through His people. It gives us the opportunity to share the hopeful message of the Gospel and to do health education. So many health problems are preventable if the right information is given. Be still my palpitating heart! It’s starting to sound very busy! When I step back to look at RAU’s accomplishments, I can’t help but think of it as the building of a house that becomes a home. The importance of a home’s foundation is a foregone conclusion. RAU didn’t just begin its work in July of 2013 when we made our move here. The foundation was being dug deep as Jacob became acquainted with pastors from Uganda, both in Kampala and Moyo. It was being strengthened with every visit to Moyo as Jacob was moved by the plight of pastors in the region and hearing their impassioned pleas to “come and teach!” them. 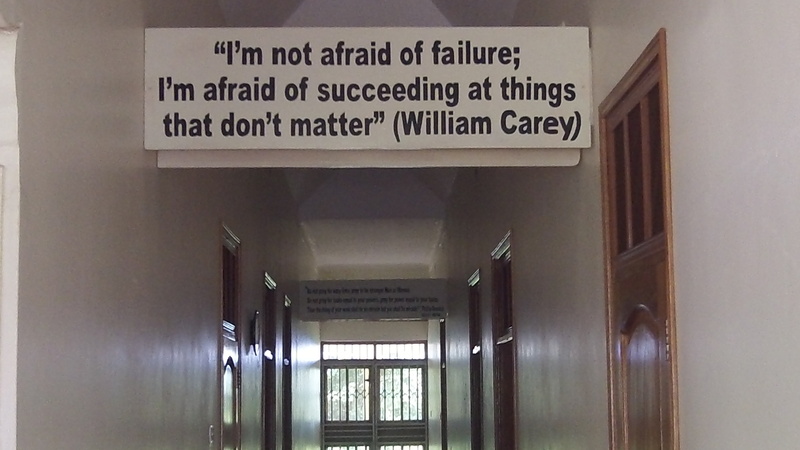 The foundation was being built up as the plans were made for a campus and a building and put in to action from opposite sides of the world, plans that couldn’t have happened without an American and Ugandan team, plans that would not have materialized if not for persistent vision-casting and willing investors. Our moving here in July was our merely moving in to a house that was made ready for life and ministry. This is home now—where we’re living life! It is not a short-term trip. By God’s grace, we will stick it out and accomplish all of the good for which this place was designed, and by God’s grace, RAU will outlast us as we implant a seed of biblical vision for a living, ever growing and vibrant Church in the coming generations. 1. Pastors’ Retreats: each retreat costs about $1500 and includes transportation, food and other amenities, supplies for the pastors, hiring extra help during the week of the retreat and even medicines for unexpected illnesses. 2. Travel expenses: having no vehicle means that we must hire taxis or bodas. This is a costly aspect of ministry here. 3. Vehicle: we are still in the process of trying to retrieve the $15,000 that we paid for a Land Cruiser. The dealer in Japan has not owned up to his end of the bargain by providing a vehicle and the broker in Uganda has not returned the money which was paid to him for transacting the purchase. We have had to contact the Ugandan police department who are in contact with Japanese Interpol. Patrick has found another vehicle which could serve us well, but we cannot move forward without the money. 4. 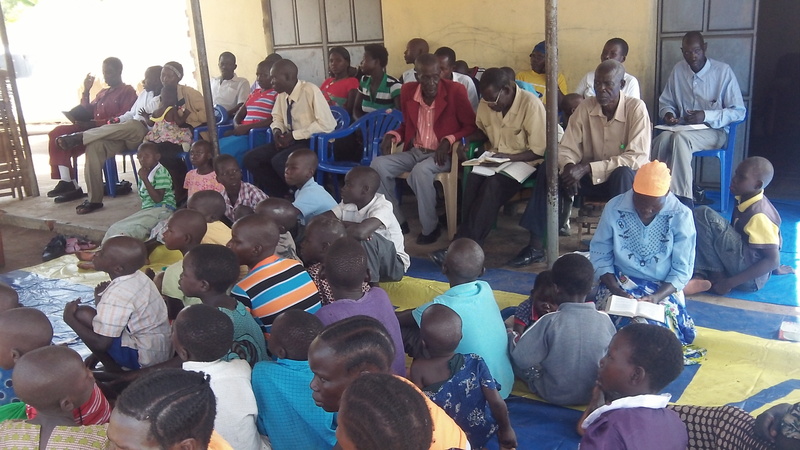 Pray for the strengthening and growth of the Church in Yumbe and Obongi. It has for years been beleaguered by Muslim opposition as well as, unfortunately, by in-fighting along denominational lines. There is a new surge of hope and desire for the churches to work together, believing that there will be revival if the churches present a loving and united front. 5. Hall of Tyrannus-Yumbe and Obongi Branch: This idea was birthed by the fact that it is logistically difficult and costly to transport pastors here on a regular basis. Initially, the thought was to find already existing structures in those towns in which to meet for discipleship. This has proved to be difficult, if not impossible. 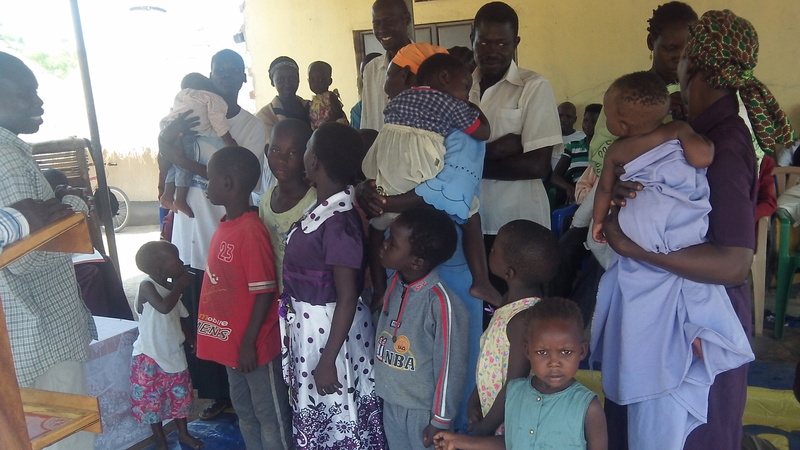 In Yumbe, the only place available is the Anglican Church; however, this presents some difficulty when the aim is to provide care to an interdenominational group. The Pilgrim’s Anglican Church has been more than gracious in offering the use of its building, but for long-term discipleship and with the need to have resources available to all, another set up would be better. 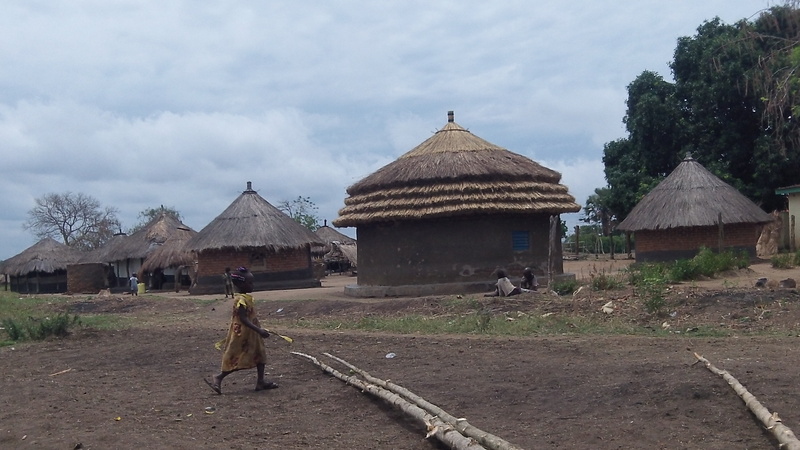 In Obongi, there are no buildings available to rent or purchase. 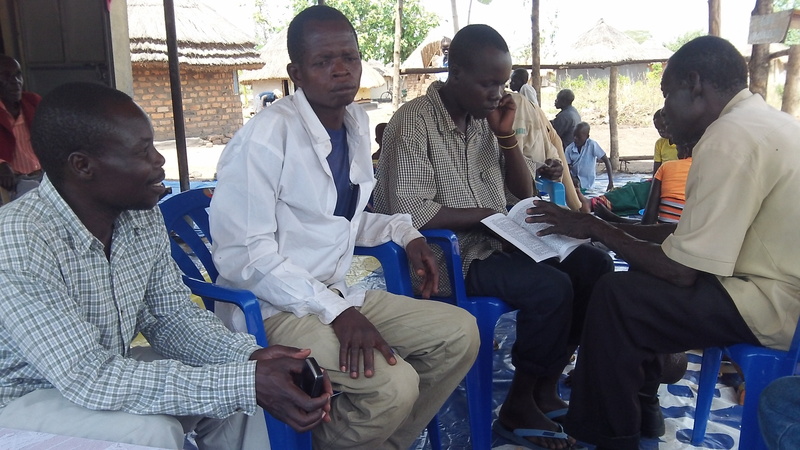 Meeting under a tree will do, if necessary, but can present problems during rainy season and gives no place to store resources for the pastors and leaders for study. 6. Medical outreach: medications are available but funding is needed to purchase them. We feel hopeful and blessed as we lay out our needs, knowing that it is God who is bringing forth in all of us both the desire and the effort, for the sake of His good pleasure, to accomplish these things. Thanks for reading and being stirred, for allowing the Lord to move your heart. Over 1100 Global Study Bibles, over 3500 Biblical sound Christian books, over 40,000 gospel tracts are now available for pastors,evangelists, and church planters. Pray that the Lord would use these materials to strengthen His people and bring people into a saving relationship with God Almighty!